One third of the world's 1.8-billion young people are currently neither in employment, education or training. Of the one billion more youth that will enter the job market in the next decade, only 40% are expected to be able to get jobs that currently exist. The global economy will need to create 600-million jobs over the next 10 years - five million jobs each month - simply to keep pace with projected youth employment rates. Reversing the youth employment crisis is a pressing global priority and the socio-economic cost of inaction is high, says a new report. 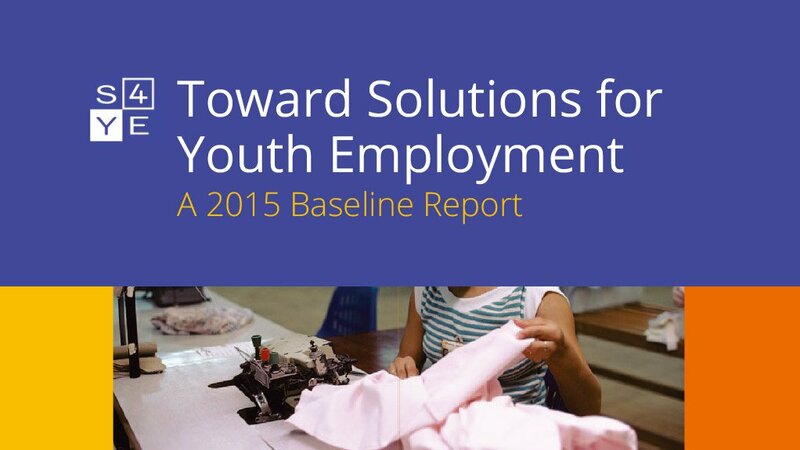 This inaugural report, entitled 'Toward Solutions for Youth Employment: A 2015 Baseline Report', is being released by Solutions for Youth Employment (S4YE) - a multistakeholder global coalition established to improve youth access to work opportunities. This coalition is a partnership started by the World Bank Group, Plan International, the International Youth Foundation (IYF), Youth Business International (YBI), RAND, Accenture, and the International Labour Organization (ILO).